Paraffin (a hydrocarbon product similar to that used in making candles) has been used for both beauty and medical treatments for centuries due to its high heat retention properties. Paraffin works as a sealant that traps in heat and moisture, opening up the skins pores, like a mini-sauna. It increases blood supply to the skin for a healthy, more radiant look. Depileve has developed a full range of products that are designed to compliment the therapeutic effects of paraffin while enhancing the cosmetic results of a treatment that is easy to apply and delightful to receive! The Ladle technique is used for feet only but not hands. The “ladle” technique is a direct result of the general public’s heightened awareness of salon sanitation. 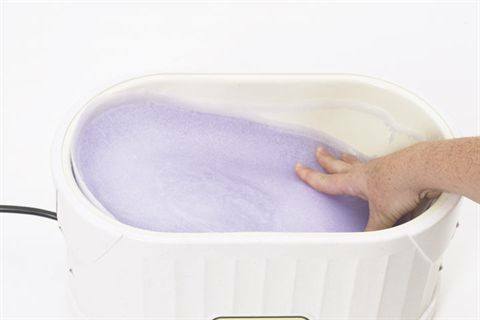 Many clients feel dipping a hand into a paraffin bath that has been used by other clients before them is unsanitary. However, the cross-contamination issue has proven to be non-existent if proper sanitation procedures are followed. The service can be especially enticing to clients during the winter months. During this time, offering a discounted paraffin service for standard manicures and pedicures or advertising it as an add-on in posters, coupons, and specials can attract many more customers to the treatment. Paraffin also works great for clients who are waiting for their appointments. Offering a complimentary paraffin dip while she waits is a great customer perk, and it also helps to entice your client to incorporate it into her service. Offering free paraffin dips to waiting clients is an easy way to talk about the great nail services offered at the salon. 1a. Dip the client’s hand into the paraffin up to the wrist, making sure the hand is ­relaxed, for a few seconds, then remove. Repeat this dip four or five times until hand is fully coated. 2a. When the dipping process is done, put hands in a plastic liner, or wrap in warm towels. 3a. Place a mitt over the plastic liner, or just leave the hands sitting in the towels. 4. 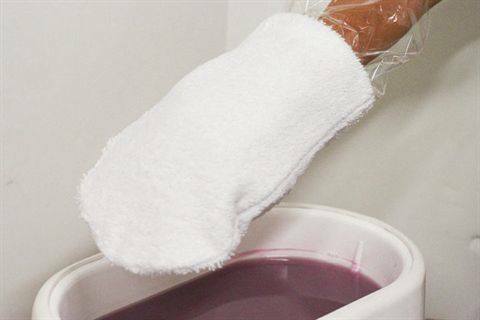 Allow the wax to stiffen for five to 10 minutes, then remove the mitts, liner, or towels. 5. Remove the paraffin and throw away the used wax. 6. Massage the hands and forearms, using massage lotion if desired. ­Remember if you are putting polish on after the paraffin dip to wipe the nail plate with a dehydrator so it is ready for polish adhesion. 1b. Some prefer the ladle technique, where paraffin is scooped into a plastic liner for individual use. 2b. While the client’s hands are in the bag, spread the wax around their hands for them to ensure full coverage. 3. Follow steps 4 to 6. As the paraffin bath is used, dust will eventually fall into the wax and settle at the bottom. 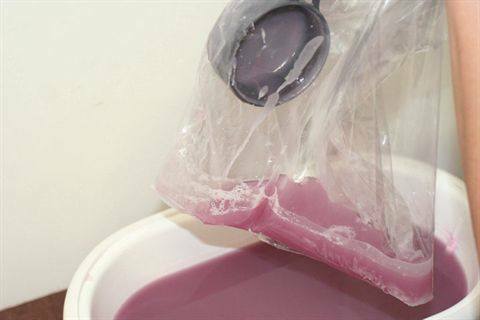 When salons are cited for improper paraffin use, it is usually because the inspector can see signs of dirty wax by just looking into the bath. Some manufacturers recommend cleaning the unit every month, while others say to do so after every 25 uses. Get to know your paraffin equipment, and when the wax appears dirty schedule regular cleanings to make sure the wax is always clean. Here are some general instructions on how to clean the bath. 1. Unplug the unit, remove the lid, and let the wax sit overnight so it can harden. Some nail techs will insert hangers, rope, or other objects into the wax while it is still liquid so they imbed into the solid block and help them remove it. 2. After the paraffin has solidified, turn the unit on for a few minutes to heat up the outside edge of the paraffin and loosen it from the unit. 3. Then press down on one end of the paraffin or use the hanger or rope to lift the block out of the unit. 4. You can either remove the block of wax, or carefully slice off the bottom layer that has accumulated the debris. Make sure that the slice fully removes the dirty layer and that the remaining wax is clean. 5. Scrape and wipe out the remaining paraffin wax in the unit. A blow dryer can help soften stubborn pieces of hardened wax to make them easier to remove. 6. Clean the inside and outside of the unit with an all-purpose cleaner or sanitizer, and thoroughly dry the unit. 7. Place the block back into the unit and add any additional paraffin to bring the level up to the proper height.